Versatile and non-destructive moisture meter, the TechScan combines innovative features with easy operation. 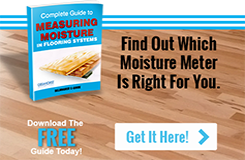 A fast and accurate non-destructive way to check for moisture in floors and walls, in caravans, motorhomes and boats. Need to take readings in hard-to-reach areas? Just freeze your readings on screen for more convenient viewing using the HOLD feature.